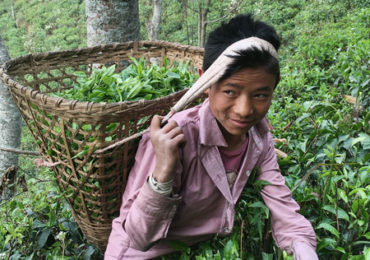 We recently visited Nepal’s first organic tea cooperative in the Kanchenjunga Mountain range ­just a stone’s throw from the darjeeling border. We spent the day touring the garden, sipping tea, and learning from the master. For as simple as a cup of tea might seem at first glance, it’s a surprisingly nuanced beverage. Did you know that all types of tea (white, green, oolong, and black) come from the same plant? That’s right. There is only one tea plant, Camellia sinensis. What distinguishes the different types of tea is actually when and how the leaves are harvested, dried, and oxidized. The newly formed buds are covered in tiny little silver hairs which give them a whitish appearance. These delicate leaves are gently dried in the natural sunlight for a very short period of time to prevent oxidation. The lack of processing for white tea is widely believed to yield a much higher level of antioxidants in the final product. The longer leaves are processed and oxidized, the stronger their flavor tends to be. The very minimal processing of white tea leaves it with a delicate, subtle, and sometimes sweet taste. White tea is best enjoyed without milk or sugar, which can easily overpower its mild flavor. To maintain the fresh and mild flavor of green tea, the leaves are usually dried by steaming or pan firing for a very short period. They do not go through an oxidation process like oolong or black tea. This process brings out a mellow, grassy flavor with citrus undertones. Green tea is best enjoyed simple with no milk or sugar. Because green tea also undergoes very minimal processing, it is prized for having a very highlevel of antioxidants (polyphenols and catechins). These particular antioxidants are believed to help increase metabolism, burn fat, lower the risk of cancer, and improve brain function. Black tea uses the most mature leaves and longest processing time. The leaves are plucked when they are fully opened and oxidized. Once picked, they are left out in the sun to become slightly wilted. The leaves are then rolled to break open their tissue and release some of their natural oils. This causes the leaves to react to oxygen and undergo a natural fermentation process. During this process the leaves change from green to red, and end up black as they are fully fermented. Traditional Nepalese black teas tend to be less than fully oxidized. They look like greenish leaves flecked with small spots of oxidation. This gives Nepalese black tea a more smooth flavor than what you might find in a traditional black tea. The multi­step processing of black tea gives it a deeper, more bold flavor than green or white tea. Black tea is often enjoyed with milk and/or sugar to help offset the tannins and strong flavor. Whatever you prefer to sip on, we hope you enjoy! Sign up to receive subscriber-only discounts and new product announcements.